Sterling silver jewellery handmade with love in Canada. Announcement Welcome to my shop! This Boxing Day weekend: Get 30% off your entire purchase when using code BOXINGDAYSALE at check out! http://eepurl.com/gtgvL for more updates and special offers! Welcome to my shop! This Boxing Day weekend: Get 30% off your entire purchase when using code BOXINGDAYSALE at check out! Simple but not simplistic. A very elegant and organic piece I can wear everyday. I get lots of compliments! Foliage necklace in sterling silver. Leaf wreath, Nature, Garden, Botanical jewellery. A perfect mix of fun and minimalism. Delicate yet sturdy and very well made. My new everyday staple! Tulip stud earrings made in sterling silver. Nature, Flower, Spring, Rose, Garden, Botanical jewelry. Thanks for my new favourite ring that is both elegant and delicate! FOLIAGE necklace. Just one left! 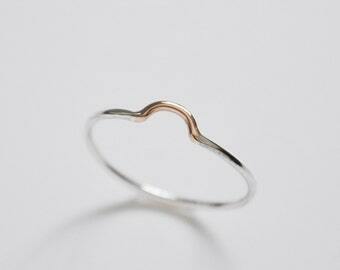 Polishing a 14k rose gold and silver WAVE ring. Only a couple of these available + they are on sale! Last pair of Foliage earrings! I'm getting ready to take time off once my baby is born and slowing down at the bench. The jewellery you see at my shop is ready to ship, get your faves now while they are available!! Foliage Bronze ear climber. Leaves, Branch, leaf earrings, Garden, Forest, Nature, Botanical jewellery. My little bench, Ronbon (my cat and studio companion) and me. Another view of my bench, where I do all the sawing, filing, sanding, dapping, polishing, sculpting, etc! A bit of how I ended up making shiny pretty things. In 2010 I was a jewelry student and inspired by all the questions and requests about my jewelry by friends and even strangers, I decided to open my Etsy shop. The name, The Angry Weather, came to mind as I started designing a lot of weather related jewelry: I was so in love, impressed and inspired, as an immigrant from Mexico, by snow storms and the dramatic changes of the seasons here in Canada. Most of my jewelry is about nature and memories. I create little things that remind me of moments, places, people and feelings. I tend to recreate the objects that bring back those experiences. Some of my pieces are also inspired by more abstract ideas: shapes that stuck in my mind or are inspired by everyday objects. I create my jewelry at my home studio in the south shore of Montreal, Canada, a little space that I love to organize and fill with inspiring things. Most of my process is made at my jewelers bench: the sawing, filing, bending, twisting, annealing, constructing, soldering, dapping, sanding, polishing, etc. Work like designing, assembling, packing, answering emails and other administrative work I made also in my studio, in another desk where I have tons of things that inspire me like, photos, prints, minerals and found objects. I sometimes use molds as a reproduction method for certain pieces, this is made using the service of a local cast business. In 2011 I was honored to be chosen as an Etsy featured seller and have my work exposed to a larger audience. Back then I was new in this business and for me was awesome and very exciting to be have my work recognized this way. I love making my jewelry and it's so amazing to think that there's people in other places of the word wearing my designs! Born and raised in Mexico and living in Canada for the last 10 years. I begin learning as a silversmith in 2007 but it was until 2010 when I founded The Angry Weather. I live in beautiful Montreal, Canada with my husband and daughter. When I work on wax designs or complex pieces that need a certain standard in size and form I usually recur to Coulage MD to cast those pieces. Coulage MD is a local studio that specializes in making molds and cast in different metals, for jewellers. Thank you for checking out my shop. everything you see there is designed and made by me, in my home studio. Take your time to see the pictures of the item you like and check very well the turnaround for the particular item you are interested in (you can easily find this information at the bottom of the description of the item). As most pieces are made specially for each customer after purchase, it takes time to have it finished, plus I might have a queue of orders ahead of yours. Rest assured your jewelry is going to be made with love, attention to detail and care. if you have any questions, feel free to contact me, i'll be happy to hear from you! - Please send me a message immediately so we can work something out. - Exchanges and refunds are valid ONLY within the first 30 days after purchase. - All shipping fees need to be covered by buyer. - The item has to be in new condition and on their original packing. Chains wear signs of use very easily, if you need to return a necklace because you are not sure of the chain length or it has some defect, please don't wear it unless is just for a short period for trying it out and be sure to clean it afterwards. - No refunds/exchanges accepted unless the product is sent back to me and confirmed to arrive. - Shipping costs and customs are not refundable. I take great care on the package of my jewelry to ensure it'll arrive to you in perfect condition, but in case some damage of the item occurs due to transportation, don't worry, let me know as soon as possible. I can exchange it upon return of the damaged item. Thank you! You can pay using Paypal or your credit card via Etsy Direct checkout. I also accept Etsy gift cards! I ship anywhere in the world! To ensure prompt shipping, please complete checkout and make sure the address on your Etsy account is updated and correct. Unless specified otherwise, my jewelry is made to order which means I'll start making your item after receiving your payment. Depending on the piece, I'd take me from one to three weeks to make your jewelry and then ship it. Ready to ship items ship from 3 to 5 business days after purchase. For more information about shipping estimates, I recommend you to read the description of the item you'd like to purchase or just convo me, I'll be glad to answer your questions. I'll mark your item "shipped" and send you a convo to let you know your package is on its way soon after I take it to the post office. If the item ships on Friday, I'll probably update the order status until Monday. I ship via Canada Post Air Mail Small Packet. For orders outside Canada, this option doesn't include tracking number. If you are interested in a tracked package, please send me a message and ask me to upgrade your shipping. Please note that this will cost you extra and all shipping fees need to be covered by the buyer. For orders in Canada: from 2 to 6 business days. For orders in the US: 6-10 business days. Rest of the world: At least 10 business days (This always depends on the country, in most cases, international orders arrive within two or three weeks). For international shipping, custom fees may apply and the buyer is responsible for covering those fees. Most of my jewelry comes protected inside a keepsake bag and that, inside a small kraft box. This to protect the piece from moving around too much and also to protect it against breakage during travelling to your destination. Don't hesitate to contact me via Etsy-conversation if you have any question about my jewelry or require any additional information, I'll be more than happy to hear from you!